Wife Of Ex-Chinese Official Given Suspended Death Sentence : The Two-Way Gu Kailai was convicted after confessing to killing British businessman Neil Heywood in 2011. She's the wife of Bo Xilai, who was removed from his post as Communist Party secretary in the southern city of Chongqing in March. 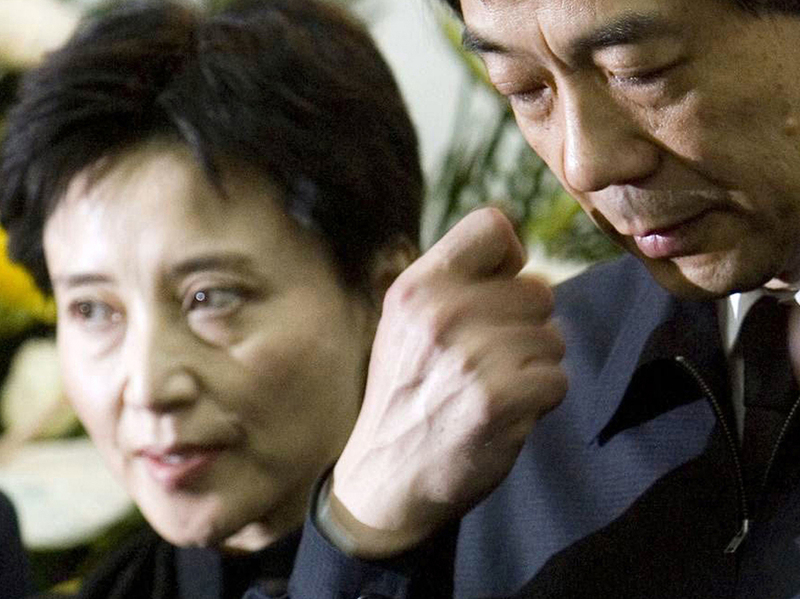 In this Jan. 17, 2007, photo, Gu Kailai, left, and her husband, Bo Xilai, attend a memorial ceremony for Bo's father. Gu was given a suspended death sentence Monday after confessing to killing a British businessman by poisoning him with cyanide. The wife of a disgraced Chinese politician was handed a suspended death sentence Monday after she confessed to killing a British businessman. As we reported earlier this month, Gu Kailai, got about four hours in court, during which time prosecutors said she and an aide did not contest the charge that they conspired to kill Neil Heywood in November 2011. Gu is the wife of Bo Xilai, the Communist Party secretary in the southern city of Chongqing until March, when he was removed from that post. The Associated Press reported that He Zhengsheng, a lawyer for Heywood, said Gu was given the suspended death sentence. Her aide, Zhang Xiaojun, was sentenced to nine years' imprisonment. The AP said a suspended death sentence is usually commuted to life in prison. The verdict marks a stunning turnaround for her husband, Bo. As NPR's Louisa Lim has reported, until recently Bo "had seemed headed straight for China's top leadership body, the Politburo Standing Committee." He, the lawyer, said he would discuss the verdict with the Heywood family to decide the next course of action. "We respect the court's ruling today," he said. "State media say Gu confessed to intentional homicide at a one-day trial held here Aug. 9 under heavy guard. The media reports the court has been closed to international media say she and Heywood had a dispute over money and Heywood allegedly threatened her son. The family aide, Zhang Xiaojun, also confessed after being charged as an accessory. Any ruling in the Gu case was politically delicate, and Chinese leaders may have decided to impose a lengthy prison term instead of death for fear that a more severe penalty might stir outrage or make Gu look like a scapegoat for her husband's misdeeds, political and legal analysts say. The party says Bo was removed due to unspecified violations." The verdict leaves open questions over Bo's fate.